The North Pointe may publish advertisements from individuals and businesses with signed contracts on file, as long as the advertisement does not violate any of the publication’s other policies. The Editorial Board can choose to decline an advertisement. All newspapers are businesses, even the North Pointe student newspaper. The North Pointe makes money, mainly, by selling advertising. The newsroom, however, operates completely separate from the business side of the operation. The news coverage has nothing to do with advertising. 1,800 copies of the North Pointe are printed and distributed free to North students and circulated to all schools in the district, along with subscribing parents, alumni, faculty emeritus and exchange schools. All advertising must conform to North Pointe editorial policy. The North Pointe Editorial Board will refuse any advertisement it deems to advocate illegal activities, or be libelous, irresponsible or obscene. Advertorials or other advertisements made to appear as news will not be run. Advertising inserts are not accepted. Political advertising for school campaigns is not accepted. 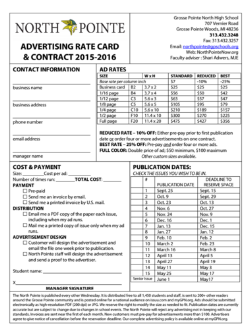 Advertising sale deadlines are two weeks prior to the issue. Advertising placement deadlines are one week prior to the issue. Clients are encouraged to submit their own advertisements as PDF files. Basic advertisement design is included in the standard rate. Charges may be made for extensive services. No additional charge will be made for the use of photos or art. Advertisers will be sent an invoice at the end of each month, with payment due upon receipt. Advertising placed by individuals must be paid in advance. New business clients with contracts of $100 or more will be asked to pay 50 percent in advance. Advertisers agree to give 30 days notice of the cancellation a contract. The North Pointe may cancel contracted advertising should the issue be cancelled or space becomes unavailable. In such cases, the North Pointe will not charge the advertiser, will give advanced notice and offer alternatives. For prices and ordering, visit the rate card for more information.